Italian for Stylish, Elegant, Fast. SB2. Image courtesy of: Ian Mackay. Line up ten classic motorcycles and include one Bimota, and I’ll guarantee a crowd will stop at the Bimota. It’s not that these machines are just aesthetically pleasing, or that they are fast. They are both of these – but in a single package Bimota combined all that a sports-biased motorcyclist would want. The Bimota story starts recently, in motorcycle manufacturing terms, in 1973 to be exact. The company was founded by Massimo Tamburini (think Ducati 916), Valerio Bianchi, and Giuseppe Morri–the company name being a combination of the three last names: BiMoTa. For much of the 60s, 70s and 80s the Japanese motorcycle manufacturers were renowned for two things: great engines and terrible frames (and associated handling). While it could be argued that the British started the replacement frame ball rolling with the Triton café racers, it wasn’t long before a number of companies sprung up to supply great rolling chassis for the Japanese engines and gearboxes. Driving force behind the early company was Tamburini. From an early age he had been captivated by the sight and sounds of motorcycles—no doubt due to living close to the Benelli factory in Rimini, Italy. The decision to produce street bikes using the Japanese engines came about after he crashed a Honda CB750 at the Misano track in 1972. This first Bimota was called the HB1 (Honda Bimota 1) and was a kit designed to carry the Honda CB750 engine gearbox. The sporting nature of the Bimota motorcycle chassis is what draws many enthusiasts to this manufacturer. Indeed, the Bimota company has had numerous race wins with their chassis over the years including the 1975 250-cc world championship with Johnny Cecotto’s yamaha-powered machine, followed a year later by a double championship with Walter Villa using their chassis to win both the 250 and 350 world titles with 2-storke Harley Davidsons. A further world title followed in 1980 when rider Jon Ekerold won the 350-cc championship. (This was an outstanding achievement as Ekerold beat the legendary works’ Kawasaki team with rider Anton Mang .) In addition, Bimota won the 1987 TT Formula One championship with Virginio Ferrari and Davide Tardozzi riding one of their YB4s. Although the HB1 started the ball rolling for Bimota, it was their second bike the SB2 which really established them in the aftermarket chassis suppliers market. The SB2 used a GS750 Suzuki power unit - which was a market leader in its own right – modified by tuning legend Yoshimura. As with most early Japanese superbikes, the handling of the stock Suzuki left a lot to be desired, but combining the superbly powerful and reliable Suzuki power unit with the lighter Bimota chassis (the total bike was some 66 lb.’s lighter) made a great combination, albeit at a price few could afford. The SB2 cost nearly three times that of a stock GS Suzuki. While the price of the Bimota may have been beyond most bikers’ budgets, it is not hard to see why it cost so much. Although the steering head was heavily braced (a typical weak point on early Japanese frames) the SB2 weighed some 66 lb.’s less than its GS Suzuki cousin. In addition to being heavily braced, the steering head was adjustable for changing the fork angle by the use of eccentric bearings. Another interesting feature of the SB2 was the swing arm. Drive chains in the late 70s and early 80s were not as strong as later variants; the high power output of the Japanese superbikes put extra strain on the chains resulting in frequent changes of chains and sprockets. Part of the problem was the location of the front pivot of the swing arms. By not being concentric with the front sprocket, the chain tension would vary during suspension movement. To negate this problem the Bimota engineers designed a complex rear suspension system that only maintained chain tension but also utilized a single shock system. Chain tension setting was achieved via an eccentric cam at the rear wheel spindle. Adding to the quality of the SB2 were the many items machined from aircraft quality billet aluminum. These machined parts included the fork yokes, brake caliper mounts and foot rest mounts. Besides being aesthetically pleasing, these parts were also strong. 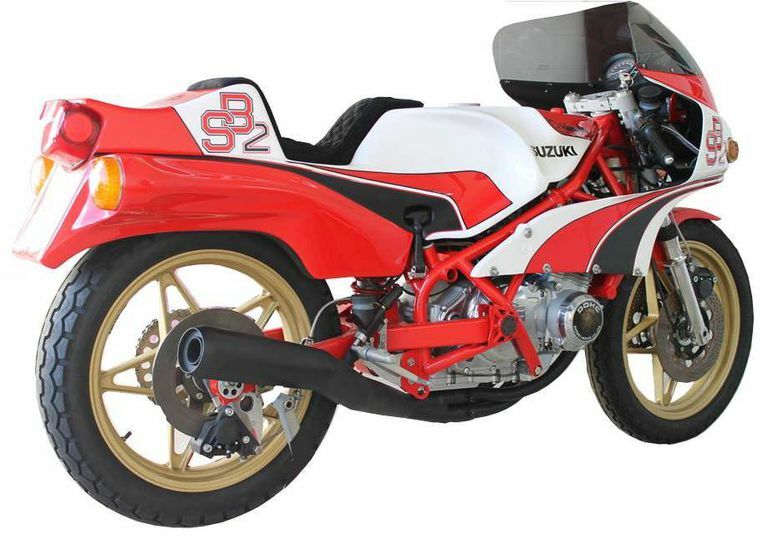 Complementing the frame and rear suspension on the SB2 were Bimota modified Ceriani forks (35-mm diameter legs) and five-spoke gold anodized magnesium wheels of 18” diameter. The one-piece tank and seat unit was made from aluminum lined fiber glass. The tank/seat unit is quickly detachable having just two rubber straps. Although the SB2 with its Suzuki power plant established Bimota to an extent, the company went on to use all of the superbike engines produced by the “big four” in Japan. The company’s chassis was so well respected that many race teams used them for superbike/super sport racing. In particular the early chassis (YB1, YB2, HDB1, HDB2 and SB1) were all successful race machines. However, their most successful model was the KB1 which used a Kawasaki KZ1 (a four-cylinder DOHC 1000-cc unit). A major change in the design/management structure of the company came about in 1983 when Tamburini left to go and work for Roberto Gallina's 500 cc GP team. His place at Bimota was taken by another Italian Federico Martini, an ex-Ducati designer. His knowledge and contacts with Ducati brought about the first Ducati powered Bimota the DB1 (a 750-cc powered machine). Martini was with the company until 1990 when he was replace d by Pierluigi Marconi. Giuseppe Morri was the last of the original founders of Bimota. He left the company in 1993. Today, Bimota is still producing top of the line motorcycles in Italy, and with World Championship successes, and numerous design awards, they will be producing future classics for many years to come.